Posted on February 18, 2019 by William A. We were both pretty shocked about the results of going completely without television for a while – especially Sherry. So today we’re sharing what we learned, what was hard, and the side effects that even we didn’t see coming. Not to mention the big question of how it will impact our viewing habits moving forward. We also tried a new paint picking method to see if it could solve a wall color conundrum at the beach house. Plus, Sherry updates you on her “tooth jail” sentence and I bask in the nerdy glory of pairing paint with geography. 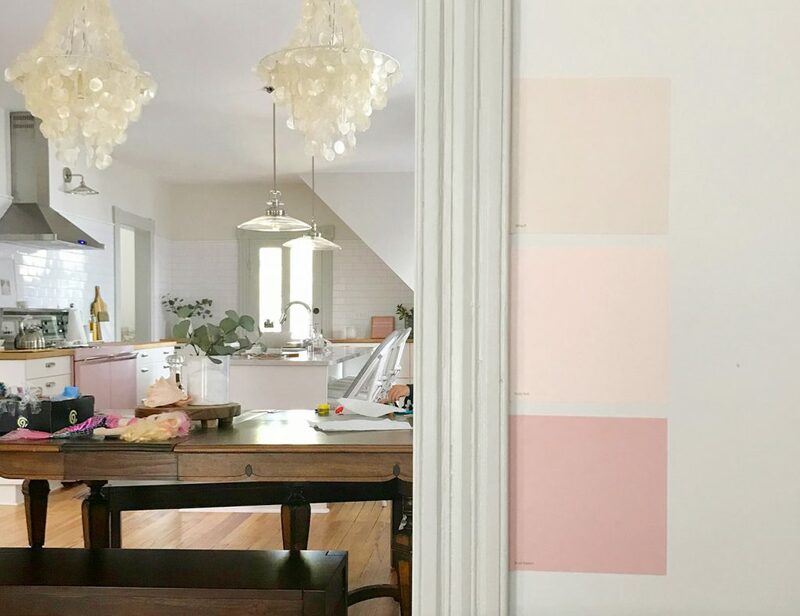 There are some of the pink swatches we tested for the beach house living room (sorry the shot’s not great – it was a quick phone picture on a cloudy day). Those removable vinyl paint color decals above are from Clare and we got them for free using a discount code they were running on Twitter. They’re usually $2 each, but as of typing this I noticed there’s a “5 for $5 & free shipping” code at the top of their site. 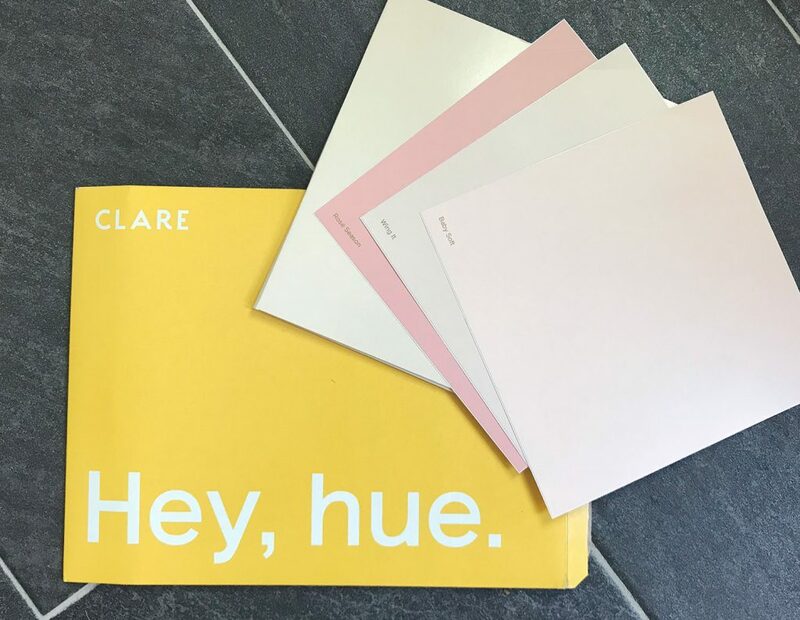 Our original discussion of Clare Paint is in Episode #109 from last summer if you want to hear more about why it piqued our interest. The three colors we got were Wing It, Baby Soft, and Rosé Season. And honestly, looking at the photos again I’m tempted to think they were better than we remember… but alas, it was pretty immediately clear in person that they weren’t 100% right. 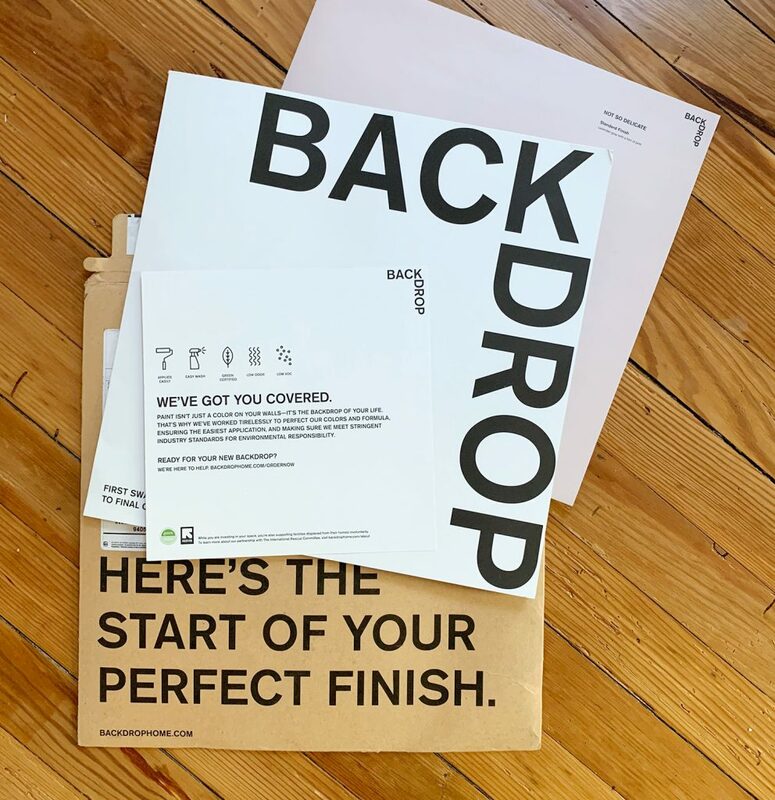 And below is a picture of the package we got a few weeks ago from Backdrop, their competitor in the online paint space. The four decal samples we bought (also $2 a piece) were Harajuku Morning, Rose Quartz, Modern Love (below) and Not So Delicate (above). 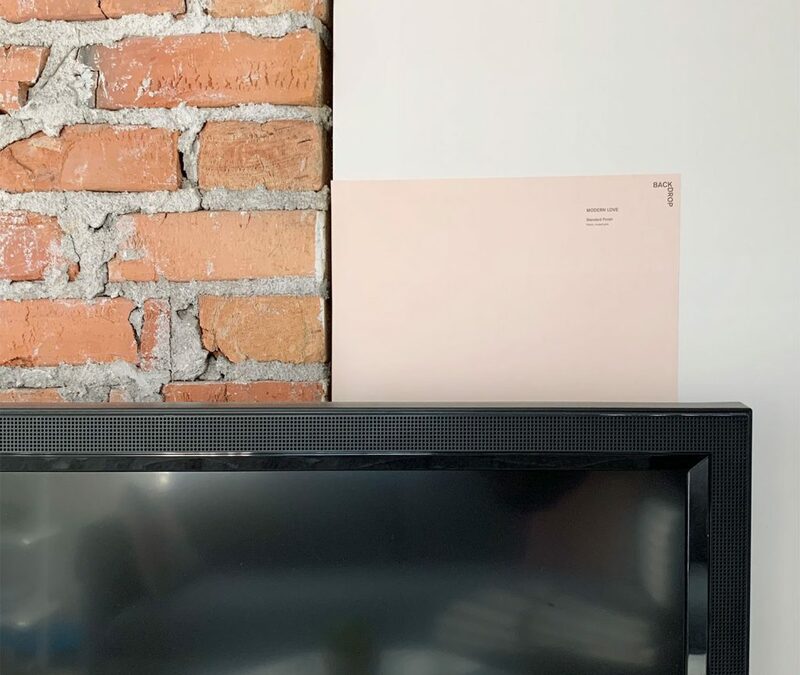 I didn’t get pictures of all of the swatches on the wall (we didn’t even put one of them up because it was clearly too dark) but this one view gives you a sense of how we’re trying to balance what works with the undertones of the chimney (and the gray trim) – so it’s kind of a tall order. We haven’t gotten a good shot of our new couch in the beach house living room yet, but we’ll share a picture soon. 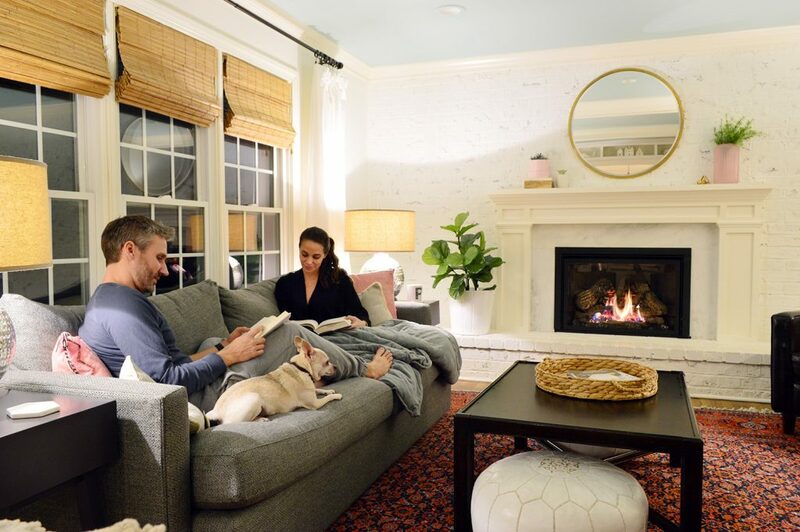 It’s the Mellow Sofa from our furniture line, which is currently sold out (thank you guys!!) but we’re working on getting it back in stock. 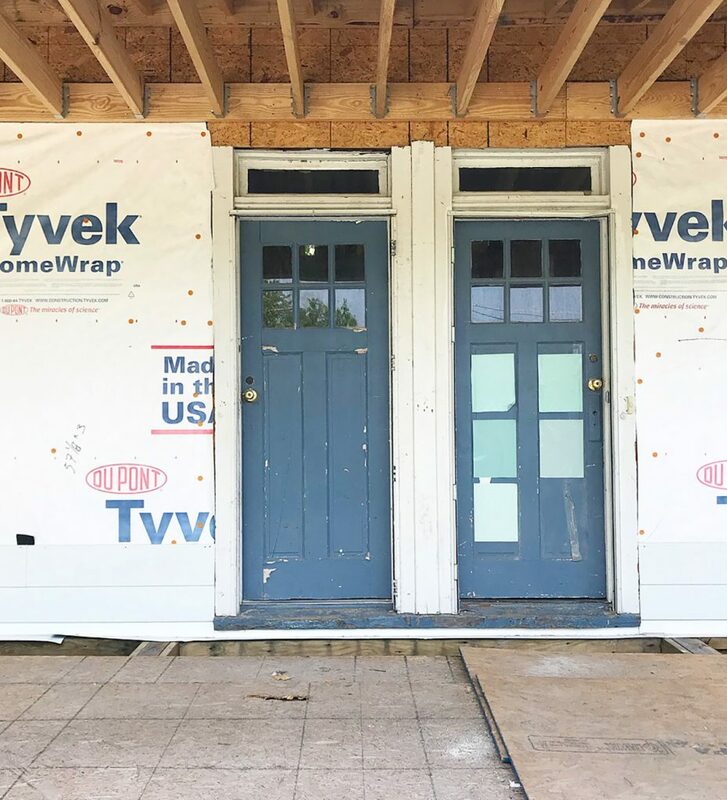 We also used some “DIY” paint sample decals to pick the color at the duplex a while back. We talk about it more in this post, but here are the decals we used. 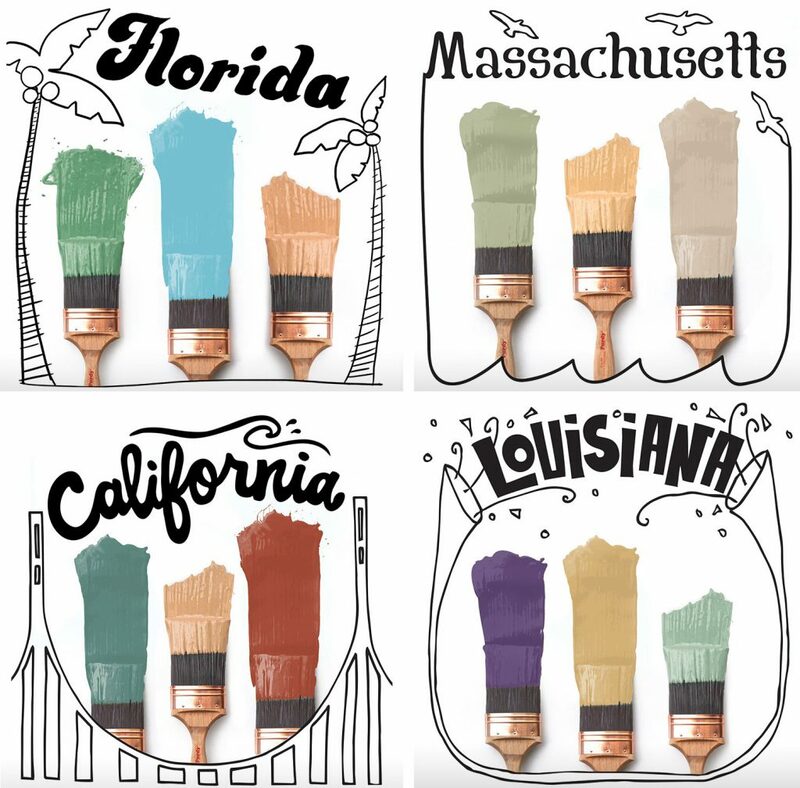 You have to buy your paint samples separately and paint two coats onto the decals yourself – so it’s not a faster or cheaper process, but it’s great for choosing a color with confidence. 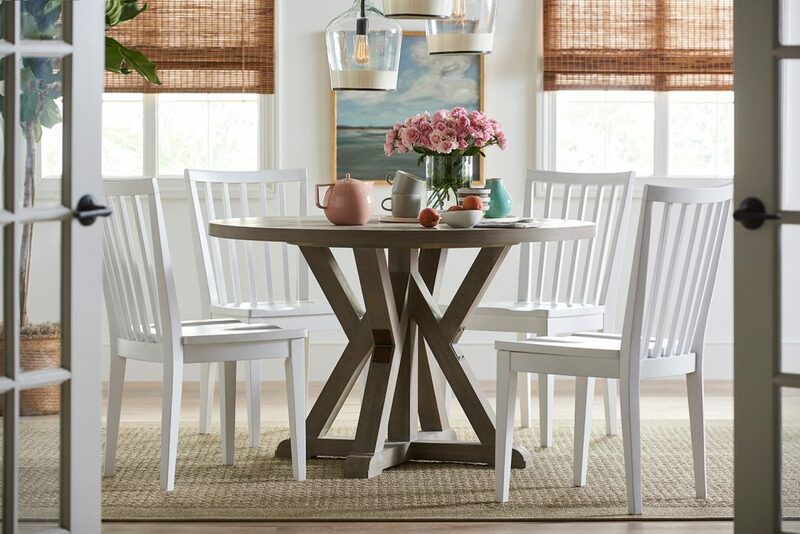 And it turns out my suggestion of Chesapeake for Virginia is actually an exterior stain color and Sherry’s “made up” Dogwood White isn’t that far off – there’s a White Dogwood (that’s actually pink)! If you missed the original mention of a experiment, it came up during our Joshua Becker interview in Episode #128. Sherry also mentioned this Happy Salmon game we’ve been playing with our kids a lot this past week. We’ve also been hitting up Life Jr. and Tenzi. 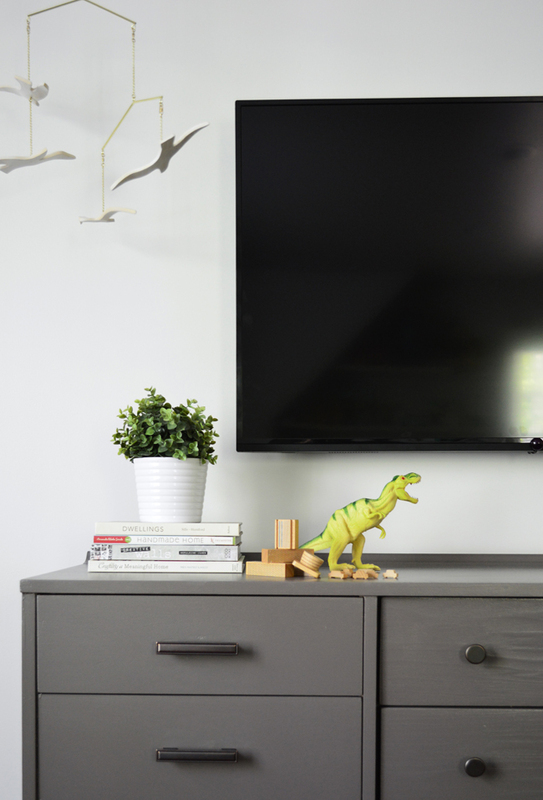 You also may want to check out our post about cutting the cable (aka: ditching cable TV). In addition to saving us lots of money each year (around $1000! ), it led to a lot of positive impacts on our viewing habits because not all of our regular shows were available in our new streaming package, so it was an opportunity to realize we didn’t really miss all of the TV we had been watching. Our furniture is on sale at Joss & Main this week (!!!) so if you’ve had your eye on anything in our line, this is a great time to snag it. And if nothing else, it’s just been fun to see the random names Joss & Main gave everything. Liverman? Singita?? PREGLO?!?! And here’s the Radium Girls book that I read during our TV free week. I forgot to mention that the enraging part of the story is that these women were actually told radium was good for them when they were dipping it in their mouths. And if you want to enjoy flossing Sherry (she lives life on the edge, what can I say? ), these are the floss picks she’s been weirdly into. 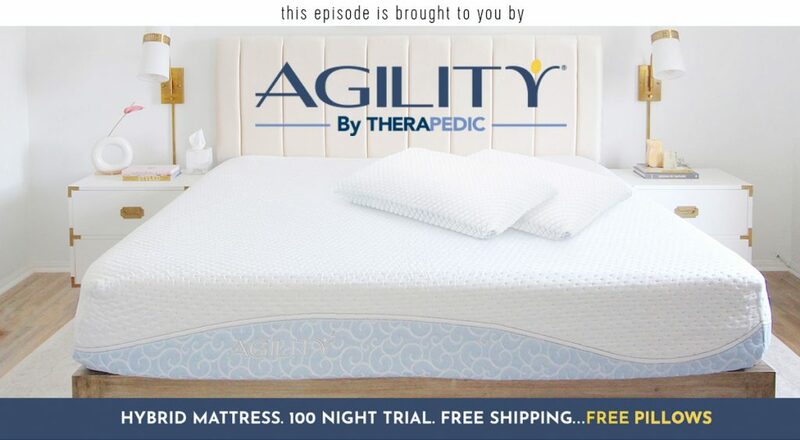 And lastly, a big thank you to Agility Bed for sponsoring this episode. During their Presidents’ Day sale, enter the code PRESIDENT at AgilityBed.com to get $150 off any size mattress plus a free pair of Therapedic TruCool Memory Foam Pillows! The post #131: The Surprising Side Effects Of Going TV Free appeared first on Young House Love.